The military history has revealed over almost 4000 years roles with different power and influence played by women in all aspects of military conflicts. Women have extinguished themselves in several wars in ancient history as leaders and fighters. Histories and legends were formed in different human communities concerning the heroism of women in ancient times, some were real and some were imaginary. The Lebanese community was influenced, due to its openness to the outside world in the early 60s, by multiple waves of western customs that took it by storm. As a result, these waves pushed it to break free from social barriers in order to launch towards new and promising horizons for a better life than what they used to live in. We then started regarding Lebanese women as competitors of men in different fields until they enrolled in the Lebanese Armed Forces. The experience began with the general directorate of general security that was the first security department offering women several occupations among its lines. It was then followed by the LAF and the ISF. These occupations only consisted of medical and administrative fields, for a woman soldier never participated in any combat mission up until now. Women enrolled in the LAF when the opportunity was able in the late 80s, where the country witnessed the most vicious battles, which cost the LAF a new amount of blood to be sacrificed, thus, pushing it to look for ways to fill the vacuum in its units. This came along with Lebanese women demanding their right to fight among the LAF in specific. The ministerial resolution number 376 was issued on 08/09/1989 and contained applied provisions related to the enrollment of Lebanese women in the LAF in compliance with women rights in equality as well as the Defense Law which gives all Lebanese citizen the right to vote. Then the resolution was followed with a service memorandum issued by the LAF Command where the enrollment rules of Lebanese women was approved from 1 January 1990. Later on a service memorandum was issued on 9 January of 1990 from the LAF Command calling upon Lebanese women to enroll as Privates for the Air Force and Naval Forces, the military academy, the Military police, the Logistic Brigade and the signaling and Republican guard regiment for a deadline from 15/01/1990 to 10/02/1990. When the war was done and the journey of “building the nation” was initiated in implementation of the Ta’ef agreement, the LAF began, in addition to its assigned missions, reorganization, equipment and training. 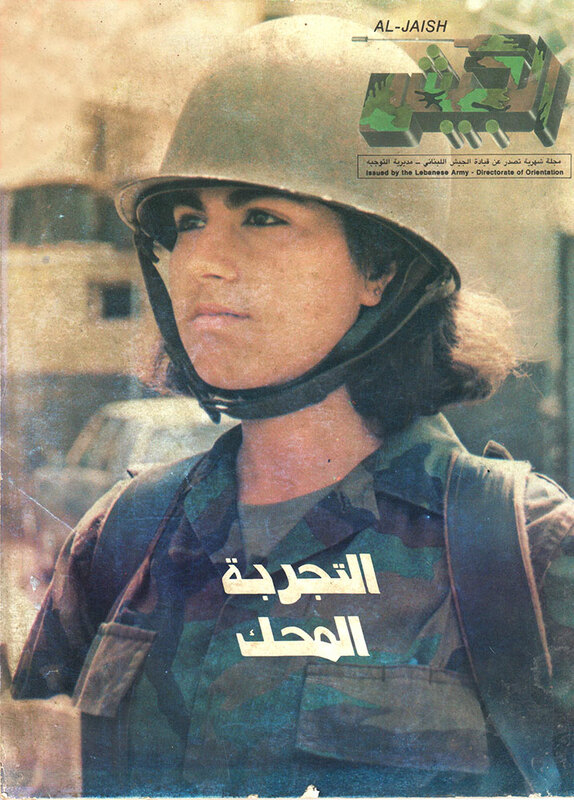 Moreover, Resolution 839/MD was issued on 15/10/1991 and specified the regulations and instruction to enroll Lebanese women in the LAF and the 2nd article in this law specified the percentage of the number of women volunteers in different departments of the Ministry of Defense to be 10% of the overall number of soldiers. Moreover, Article 3 specified the enrollment and service of Lebanese citizens in different occupations and specializations except for direct combat units and direct combat support. The abovementioned resolution contained applied provisions related to the enrollment and service of Lebanese women. Article 4 consisted that women volunteers should be subject to the same training as male volunteers, provided that physical capability is taken in consideration in different sports exercises and drills. A course for specialized officers (males and females) was inaugurated in 1992 in the military school (currently, military academy) where 32 volunteers, holding university Bas in dentistry and business management, enrolled. Instructions were implemented over them and they were exposed to the same trainings as their male counterparts. After their graduation, they were assigned to suitable units. Furthermore, the years 1994 – 1996 – 1997 witnessed the enrollment of several specialized females from Corporal to specialized Adjutant, holding BAs in medicine, IT and Management. Female officers were promoted after having volunteered as specialized NCOs between 1994 and 1997 or as Privates in 1990 and were promoted until they earned the right to be candidates for the rank of Lieutenant. These courses were under hard and serious conditions during training as stipulated in instructions. Therefore, they spent their courses just as males in training camps and were exposed to the same program which extended to 8 months constituting only weekend leaves. That was followed by consecutive courses, even if they were far apart, over the years with different percentages and with different medical and educational levels. However, the role of women in the Army was not limited to the administrative side and has stretched currently to assuming tasks in combat units. Maternity is the main challenge for women in general and for women volunteers in specific, for the effort exerted by women in order to accomplish balance between their duties, occupational and familial, subjects them to frustration and exhaustion. Therefore, women often are in a conflict between developing themselves and between their instinctive feelings of maternity. However, women have overcome the experience of the military field, the most male-oriented field, with trust and will, thus helping them assume the highest leading posts in Arabic and foreign armed forces. In Lebanon, Lebanese women have entered the military society just as the other women in the world and have proven over the years to be successful in all assumed missions. Women are aiming to be assigned to fields missions in order to highlight their capabilities and energies and invest them. Women have added value to the military institution. The 1st women volunteers in the LAF - Source: the Army Magazine, issue 68, July 1990. Monthly pay slip of one of the first females enlisted in the army.